Growing crops is just one step in running a successful farm—making the farm or market garden economically viable requires another suite of skills, including finding land, planning what crops to grow, ensuring food safety, marketing the crops, and managing income, expenses, and labor. 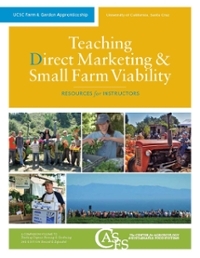 educating more than 1,500 apprentice growers in organic production, farm and business planning, direct marketing at a roadside farm stand, and Community Supported Agriculture (CSA) management through hands-on training. Generous support from the Gaia Fund, the USDA Beginning Farmer and Rancher Development Program, Western Sustainable Agriculture Research and Education (WSARE), the Joseph and Vera Long Foundation, and the Eucalyptus Foundation funded the resource guide’s development.